For those of you who live in Chicago, you may or may not have known that last weekend was the Renegade Craft Fair in Wicker Park. The fair is comprised of over 300 booths, all manned by craftspeople selling their handmade goods. Since I live down the street, I took some time to check out this wonderful event. While perusing the stalls, I also checked out the booths’ social media presence, to see what they were doing to promote themselves, so I could share it with you. The number one most common piece of promotion I saw was a notebook set out, asking people to please provide their email address. (The second most common was handing out business cards with essential website and email address on them.) There were promises for newsletters, online deals, and so forth. 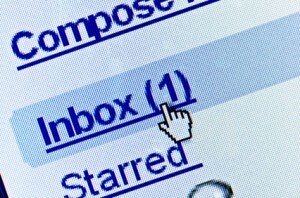 Email really is an easy and ingenious way to build a customer base. In the age of Twitter, Facebook, and blogging, the idea of creating a mailing list can sometimes get lost. Email is the first thing people look at in the morning, and a well-crafted email newsletter has the potential to bring in some revenue and keep your business in the forefront of your potential customer’s minds. I’ve heard from a lot of small business owners that they are apprehensive about sending out an email. Below are a few instances where you should send out an email to your list. It’s a great idea to constantly be growing your email list. You can do this a number of ways. If you have a brick and mortar store, have a notebook at the cash register so customers can leave their contact info. Make sure you maintain an email database and update it anytime a customer emails you a question or request. Invite people to be your LinkedIn connection and add their email address to your database. Email marketing is a really great way to build up your client base. Don’t forgo this opportunity. For more ideas on what to put in these emails, read this post on E-Newsletters. So True. I’ve been using newsletters for YEARS to stay in touch with my clients and have even been writing them for others for the last few year and it’s SO TRUE. You have to stay in touch. Now I’ve even gone to email newsletters and have the opinion that it’s more important to stay in touch than what you say. I have clients I haven’t talked to for years call me when they get my newsletter and feel like I’ve been there all along just in case they needed me. AND they didn’t forget about me and they KNOW it haven’t forgotten about them.